Bare & Nearly Naked is our Early Teddy who has been Darned with Love! 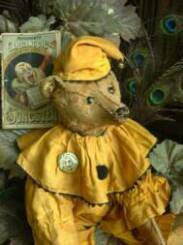 Teddy shows his sweet personality deep within the gleem of his shoe buttoned eyes & devilish imaginary smile. He is most likely made by the British company Farnell. Measuring about 12” tall, he has some mohair left to him which seems blonde. His body shows some scars and stains of much playwear in his lifetime. His joints move well and remains of some of his claws and good felt left to his paws though hand pads have been repaired by exquisite darnings. Dressed in what is left of his dress shirt with tiny bow tie which is in rough condition with tear underarm and in the back. With his original oufit is his wonderful pair of homemade overalls in a beige with chocolate and rose color flowers with straps his mamma made him. The straps have torn in the back most likely from trying to undress his sewn on clothing. This handsome & charming boy is looking for a date for the holidays.